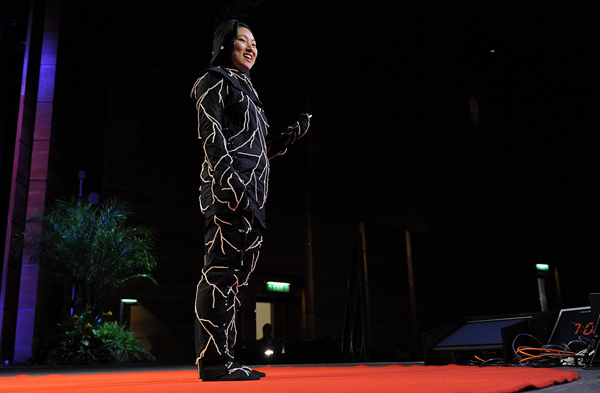 [Image: Artist Jae Rhim Lee models her "mushroom death suit"; photo by James Duncan Davidson/TED]. —Artist Jae Rhim Lee has designed a "mushroom death suit," a posthumous garment impregnated with mushroom spores that will consume the corpse eventually wearing it. As she explains her inspiration, "by trying to preserve the body we poison the living" through the use of formaldehyde as an embalming tool; her suit thus offers "a new way of thinking about death," to put it mildly. Read a short interview with the artist over at New Scientist. While we're on the subject of formaldehyde, meanwhile, don't forget that billionaire David Koch of Koch brothers fame, bankrollers of the Tea Party, owns the paper firm Georgia Pacific, one of the nation's largest producers of formaldehyde. More to the point, for years Koch had successfully lobbied for formaldehyde not to be listed as a carcinogen, despite all medical evidence to the contrary, because your and your family's health stands in the way of profitable business expansion. As Koch's Tea Party knows all too well, using governmental regulation to protect U.S. citizens from being industrially poisoned is not a sign of patriotism, let alone of wisdom or responsibility; it is proof that you obstruct the righteous tide of personal freedom. —A music critic for the New York Times attends a game at Yankee Stadium—and critiques the sounds he hears there, referring to the new arena as "a comfortable and acoustically lively new concert hall." What would happen, he asks himself, "if I treated a game as a kind of outdoor musical piece?" And what if everyday public sounds could be subject to music—that is, to audio—criticism? —Speaking of New York City, 30 July 2011 will see the widespread arrival of a new architectural typology: the pop-up wedding chapel. 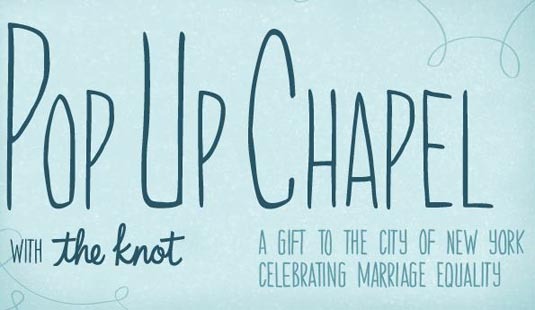 Some couples may be married in a chapel made of three-dimensional plywood letters arranged in a circle. Others could find themselves in one composed of interlocking pipes connected with plastic zip ties. Certainly, the couples who marry inside such structures intend to form unions far more permanent than the sites where they will exchange vows. Be no larger than 8'-0" x 8'-0"
So get to it! And congratulations to everyone finally able to marry—and congratulations to New York for taking a stand for love. [Image: Mount Everest, via Wikipedia]. —Is Mount Everest as tall as Nepal says it is? The Chinese don't think so; they "have argued [that the mountain] should be measured by its rock height. Nepal said it should be measured by its snow height—which is four meters higher." So which is it? Nepal has responded by organizing "a new survey of Mount Everest to end the 'confusion' over the exact height," the BBC reports, adding that "stations will be set up at three different locations using the global positioning system, and the task of measuring the peak would take two years." —A 39-story skyscraper in Seoul had to be abandoned temporarily after it started "to shake violently for 10 minutes" in the middle of the afternoon, for no apparent reason. Turns out, it was all because of a Tae Bo class: "It just happens to be that the vibration set up by the Tae Bo exercises coincided with the resonance frequency unique to the building," an engineer explains. "When an external vibration hits the resonance frequency of a certain object, the vibration is amplified and causes excess shaking even from slight movement." See the San Francisco Chronicle for more. —The Pigeon Keepers of Bushwick by photographer Chris Arnade. [Image: Painting by Andre Sokolov from Drifting on Alien Winds: Exploring the Skies and Weather of Other Worlds, courtesy of Springer]. In fact, the weather on other worlds is terrifying, inspiring, and baffling. 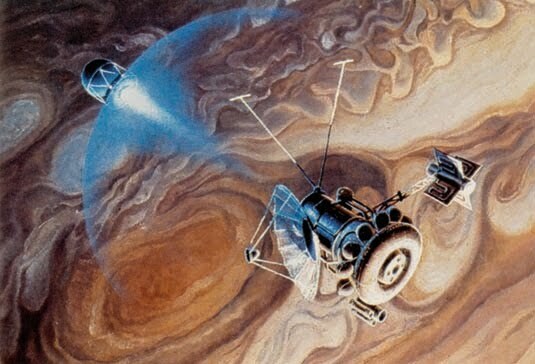 Lightning bolts sizzle through Jupiter’s atmosphere, powerful enough to run a small town for days. Hydrocarbon showers fall on Saturn’s moon Titan, and sulfuric acid rains down on Venus. Snows drift from carbon dioxide clouds on Mars and methane ice crystal hazes on Neptune, where blue storms the size of Earth come and go in a matter of months. Download this 4.3mb PDF to sample the book's contents. (Thanks to Nicola Twilley for the pigeons link and to Nate Berg for the Tae Bo earthquake link). Great info on the use of formaldehyde. It is definitely time to stop letting individuals prevent us from making the changes that we need to make. I'll be wearing a spore suit when it's my time!